In my early twenties, when I was a postdoctoral fellow at Cambridge University, I told my employer Stephen Hawking that I was going on a three month leave of absence. We were unlocking the mysteries of the universe together, and I wanted to part ways to go build a tech startup. 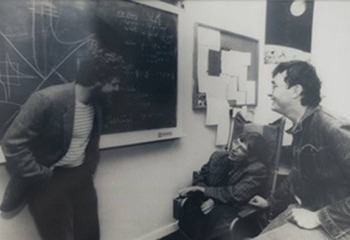 Photo: Nathan Myhrvold (left) with his mentor Stephen Hawking. My interests have always been all over the map. I’m an inventor, a CEO, a chef, a photographer. I recently finished a study about dinosaur growth rates. And I’ve been lucky enough to become pretty good at some of these things, in large part because of the people who’ve mentored me along the way. Stephen was one of my first great mentors. I wanted to be a physicist at the time, so after graduate school I applied to a whole bunch of places. I think I wrote sixty-three letters. I remember being in Japan when I got the call. It was four in the morning when the phone rang. My wife (girlfriend at the time) answered the phone and said, “It’s for you. It’s from England.” The phone connection was bad and this woman with a British accent was saying “I’m here with Stephen Hawking.” Right. I thought it was a joke. But then I heard this murmur on the other end of the line. It was Stephen, and he wanted to offer me a job. So I said yes. I loved working with Stephen. He’s brilliant. He was very well-known within the realm of British academics, but despite that he was and still is a very down-to-earth guy. He was always doing things for the benefit of his students. I remember there was a prestigious conference Stephen was invited to, but he sent a grad student in his place. He knew the topic was more important for his student’s thesis than it was for him to make an appearance. I’m fortunate to have had amazing mentors, and if there’s one thing I’ve learned from them all, it’s that wisdom comes more easily when you’re surrounded by people with different interests. Bill Gates mentored me in business when I became Microsoft’s CTO. I was an apprentice to award-winning chef Thierry Ratureau, who helped me hone my skills in the art and science of cooking. Like-minded advisers are important, but what is often overlooked, in my opinion, is the value of having mentors who can teach you about something unfamiliar. Who encourage you to view the world through different lenses. It’s been decades since I told Stephen I was taking that three month leave of absence from Cambridge. I still haven’t returned. While Stephen became the world’s foremost physicist, I became the world’s backmost physicist. I don’t think he holds that against me, though. That’s what made him such a valuable mentor. He encourages people to “look up to the stars, not down at your feet.” And so I guess I’m still exploring. A look at IV’s “technology expo” on Capitol Hill where policy makers and staffers had the opportunity to see first-hand some of our breakthrough technologies. As a new Congress descends on DC, the push for changes to our patent system continues. In February, despite already historic changes to the system over the past few years, Senate leaders called for more tweaks. With a new administration in town it’s a good time to review the bidding.